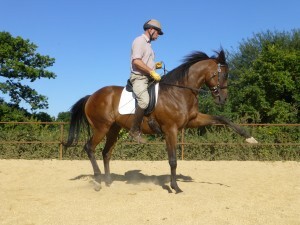 Spanish walk is of great value to many horses and yet often overlooked as a circus trick. It has many benefits as it frees the shoulder, lifts the horse from the for hand and for some can be the start to passage as it is pushed into trot. I am often asked how do I start this exercise and so will publish my method here for all to try. Spanish Walk is a series of transitions, before the final aids are completely understood by the horse. Believe it or not the very first step to starting a horse to do this, is picking a horses feet out. A horse should pick their feet up on demand, not by us pulling. I always say the foot is attached to their leg therefore they lift it. Start this process by tapping the front of the cannon bone with something solid enough to irritate. Be patient and a little dogmatic but never lose your temper, but persevere till the horse moves its leg. This will probably be a stamp. Praise the horse highly and repeat, soon in a few days you should be able to the hold the horses lifted foot and clean it. This then can be taken into the school. Tap the front of the cannon bone with your whip and the horse will now lift its leg, walk forwards, halt and repeat and walk. Once the first step is almost anticipated by the horse ask whilst the horse is walking slowly forward. The leg will need to be taped at around the moment it is vertical and about to go back. This will give the brain time to consider the leg has to be raised although they are moving. As they lift the leg and because they are still going forward they have to place it out in front of themselves ready for the next step. Some horse may stop and stamp, here work needs doing with the horses understanding walk on when you ask for it. Don’t forget praises and making much of the horse. Work one leg on one rein until the horse starts to anticipate the stick and lifts the leg stretching it out, also don’t make the horse bored and don’t let them get lazy. Work on the other rein and the other leg till understood. Asking for a high leg action is good but not all lift their legs horizontal, but a straight leg is a must. Often at this point the horse will offer their first steps of Spanish walk if you tap both legs in succession, but at this stage not important, fun, but if riding this movement is to be obtained go to the next step. Tap the leg with stick, get reaction and walk forward. At this point it may help to have another person on the ground that helps trigger the movement. Move the whip up the leg to the shoulder obtaining the same results and ensure the horse walks forward whist lifting the leg. At this time we are not looking for a rhythm but for understanding and anticipation. With 2 obtained when you bring the whip to the shoulder you will raise that hand and rein as you ask, this will importantly remove weight from the leg being lifted and allowing it more freedom to move. Do not worry to much about where the horse carries their head at this point because they will use it to aid their balance. Obtain one stride SW then walk four normal, ask again the one stride SW and repeat on both reins till achieved without the horse needing to stop when being asked, it should be a fluid walk. The walk also should not be hurried and try not to use any other aids whilst the horse is concentrating. Reduce the number of strides of normal walk. The horse should now be able to lift its leg every stride on one rein and correspondingly the same on the other. Before asking for both legs first attempt the Waltz which is one stride SW-R, normal L, normal R, SW-L, normal R, normal L, SW-R and so forth. Following this you can start asking for both legs and at this time the horse should start reacting to the hand being lifted. This movement is transitions between left and right rein and therefore must be ridden as such. If the right leg is being raised the rider needs to sit on their left outside seat bone, so as to lighten the right shoulder and then if necessary maintain forward movement with a light right inside leg, so to ask for the left leg is a change of rein with opposite aids. There is a rhythm to the movement and needs to be found so it is fluid. The final transition is not needing to raise the hand, because as you remove your weight from the leg and sit on your outside seat bone the horse will raise the leg. Enjoy and smile and impress. Try things like getting the horse to wave good by to people as they leave, they will be impressed because they don’t know how you are asking, also when out and a dog starts barking ride at the dog they tend to back off. Hope this helps some to have a go and horses find it enjoyable as well.